Been looking all over for this on. After being a fan of the Banana bread, I was really curious to try this. I am not sure why they went with a 11.2 oz bottle instead of the traditional 500ml but I am sure it is a treat. Rich Toffee, caramel, pilsner grains and cereal, brown sugar, hints of chocolate or like a dark fruit, biscuit bread, butter scotch, almond, hazelnut, honey and vanilla. Sweet fragrances all around. Caramel, toffee, crème brulee notes, chocolate hints, vanilla, strong earthy hop bitterness, brown sugar, nutmeg, hazelnut, honey, rye bread, butter scotch. The warmer the beer, the sweeter it gets. While it is a very good beer, you still have to let it warm up if you want to get that sticky toffee sweetness out. May not be as apparent in the first sip but after a couple, you will notice it linger for a while. Very nice stuff but not super consistent with balance with lower temperatures. For those that do not like super sugary beers, it may just have enough sweetness to cover you but there is more earthy bitterness than sweetness, especially at first couple of sips. Let it warm up and it gets better. What let me give it a higher score than expected was the nice blend of hazelnut and toffee as well as those hints of chocolate and vanilla. Tomoe Mami from Madoka Magica who likes tea and dressing up. 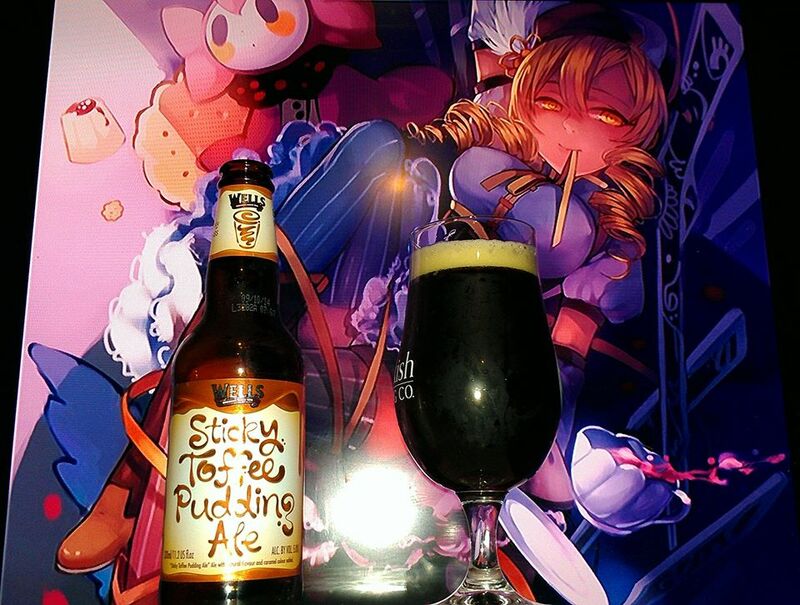 Pretty fancy considering this is an English Brown Ale but because the colors in the artwork fit with the label and the fact that the beer consist of the rich toffee flavors (not to mention the English influence like it might have been in the old days), I figured it fit since I Tomoe loves desserts like pudding as well.